- Graphite coated tape improve the abrasion resistance and higher temperature performance. - Suitable for use in hot, dry conditions and aggressive environments where flexing may damage untreated fabrics. Noted for high temperature resistant up to 1050 ° C, ceramic fiber textiles feature excellent properties of lightweight, low thermal conductivity and chemical stability resisting attack from most corrosive agents. They are widely used in thermal insulation industry. rotating mahine . stator coils winding tape. our company is amongst the prominent manufacturers Woven Roving Tape, which have low fuzz, dirt and impurity content. Developed using cutting-edge technology, these products are commonly used with chopped strand mats in the form of structural layers of the laminates. We offer these taps at cost-effective prices. 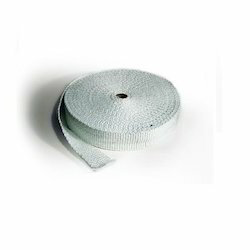 We are known in the industry for our expertise in manufacturing and supplying a wide gamut of Fiberglass Woven RovingTape. We are one of the foremost manufacturers andimporters of Graphite Coated Fiberglass Woven Tape. 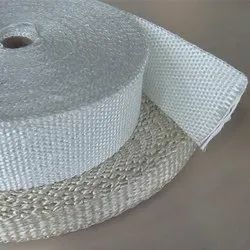 We are recognized as one of the leading fabricators, exporters and traders of a comprehensive array of Woven Fiber Glass Tapes that are fabricated using fiberglass bulk textured yarn coated with anti-alkaline resin and gum solution. These are widely used in different industries for various applications. 1) High tensile strength: Has tensile strength even more than steel wire of same diameter at a lower weight.